XNX is an extremely flexible transmitter that can be configured to accept an input from any of the Sieger range of gas sensor technologies. It can also be configured to provide a wide variety of industry standard output signals. 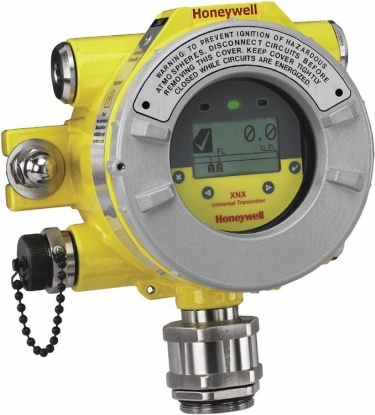 This enables users to have a single type of interface to all their gas detection needs, even when different types of detectors are employed, to most effectively address the different gas detection applications on site. The most effective gas detection systems often employ a variety of detection technologies including point flammable detectors (both catalytic and infrared type), toxic and Oxygen electrochemical cell type detectors and open path infrared detectors. XNX provides a common transmitter interface to all of these and can be configured to provide industry standard signal outputs to match the individual requirement of each application or the preferred site standard. If site output standards change, XNX can be reconfigured to provide the new required output. XNX has also been futureproofed by having the ability to have other output modules fitted as new output standards are developed and adopted by industry. Having a common transmitter platform for all your gas detectors brings further benefits. Common tools and installation methods simplifies and reduces cost of installation. The common user interface makes operation faster to learn and easier to navigate, thus reducing time needed for training as well as reducing the chance of incorrectly interpreting messages or incorrectly changing settings. Common spare parts also mean reduced maintenance spares stock levels and cost for all detectors. XNX allows you to apply the most appropriate gas detection technologies for each application, standardise the interface to those detectors and has the flexibility to provide the required signal outputs. With XNX the answer is always yes. XNX-AMSV-FNCB1 XNX transmitter, HART over 4-20mA output, ATEX/IEC approved, 5 x M25 entries, painted 316 stainless steel, with optional Foundation Fieldbus™ output, including MPD catalytic sensor 0-100%LEL. XNX-AMAV-MHCB1 XNX transmitter, HART over 4-20mA output, ATEX/IEC approved, 5 x M25 entries, painted LM25 aluminium, with optional ModBus output and local HART interface port, including MPD catalytic sensor 0-100%LEL. XNX-AMSV-NNIF1 XNX transmitter, HART over 4-20mA output, ATEX/IEC approved, 5 x M25 entries, painted 316 stainless steel, including MPD IR Hydrocarbon (Propane) sensor 0-100%LEL. XNX-AMSV-FHIF1 XNX transmitter, HART over 4-20mA output, ATEX/IEC approved, 5 x M25 entries, painted 316 stainless steel, with optional Foundation Fieldbus™ output and local HART interface port, including MPD IR flammable sensor 0-100%LEL. XNX-AMAV-FNIF1 XNX transmitter, HART over 4-20mA output, ATEX/IEC approved, 5 x M25 entries, painted LM25 aluminium, with optional Foundation Fieldbus™ output, including MPD IR flammable sensor 0-100%LEL. XNX-AMAV-FHIF1 XNX transmitter, HART over 4-20mA output, ATEX/IEC approved, 5 x M25 entries, painted LM25 aluminium, with optional Foundation Fieldbus™ output and local HART interface port, including MPD IR flammable sensor 0-100%LEL. XNX-AMSV-NHIV1 XNX transmitter, HART over 4-20mA output, ATEX/IEC approved, 5 x M25 entries, painted 316 stainless steel, with optional local HART interface port, including MPD IR methane sensor 0-100%LEL (0-5%V/V). XNX-AMSV-FHIV1 XNX transmitter, HART over 4-20mA output, ATEX/IEC approved, 5 x M25 entries, painted 316 stainless steel, with optional Foundation Fieldbus™ output and local HART interface port, including MPD IR methane sensor 0-5%V/V. MPD-AMIV1 XNX MPD Sensor, M25, ATEX/IEC approved, IR Methane 0-100%LEL or 0-5.00% Vol. MPD-AMIC1 XNX MPD Sensor, M25, ATEX/IEC approved, IR Carbon Dioxide 0-5.00%Vol. MPD-UTIV1 XNX MPD Sensor, 3/4"NPT, UL/CSA approved, IR Methane 0-100%LEL or 0-5.00% Vol. MPD-UTIC1 XNX MPD Sensor, 3/4"NPT, UL/CSA approved, IR Carbon Dioxide 0-5.00%Vol. 1226-0299 XNX MPD Cartridge, IR Methane 0-100%LEL or 0-5.00% Vol. 1226-0301 XNX MPD Cartridge, IR Carbon Dioxide 0-5.00%Vol. XNX-UTSV-MHNNN XNX transmitter, HART over 4-20mA output, UL/CSA approved, 5 x 3/4"NPT entries, painted 316 stainless steel, with optional ModBus output and local HART interface port, configured for mV sensors. XNX-UTSV-FNNNN XNX transmitter, HART over 4-20mA output, UL/CSA approved, 5 x 3/4"NPT entries, painted 316 stainless steel, with optional Foundation Fieldbus™ output, configured for mV sensors. XNX-AMSE-MHNNN XNX transmitter, HART over 4-20mA output, ATEX/IEC approved, 5 x M25 entries, painted 316 stainless steel, with optional ModBus output and local HART interface port, configured for XNX toxic and Oxygen sensors. XNX-AMSE-FNNNN XNX transmitter, HART over 4-20mA output, ATEX/IEC approved, 5 x M25 entries, painted 316 stainless steel, with optional Foundation Fieldbus™ output, configured for XNX toxic and Oxygen sensors. XNX-AMAE-NHNNN XNX transmitter, HART over 4-20mA output, ATEX/IEC approved, 5 x M25 entries, painted LM25 aluminium, with optional local HART interface port, configured for XNX toxic and Oxygen sensors. XNX-AMAE-FHNNN XNX transmitter, HART over 4-20mA output, ATEX/IEC approved, 5 x M25 entries, painted LM25 aluminium, with optional Foundation Fieldbus™ output and local HART interface port, configured for XNX toxic and Oxygen sensors. XNX-UTSE-NHNNN XNX transmitter, HART over 4-20mA output, UL/CSA approved, 5 x 3/4"NPT entries, painted 316 stainless steel, with optional local HART interface port, configured for XNX toxic and Oxygen sensors. XNX-UTSE-MHNNN XNX transmitter, HART over 4-20mA output, UL/CSA approved, 5 x 3/4"NPT entries, painted 316 stainless steel, with optional ModBus output and local HART interface port, configured for XNX toxic and Oxygen sensors. XNX-UTSE-FNNNN XNX transmitter, HART over 4-20mA output, UL/CSA approved, 5 x 3/4"NPT entries, painted 316 stainless steel, with optional Foundation Fieldbus™ output, configured for XNX toxic and Oxygen sensors. XNX-UTSE-FHNNN XNX transmitter, HART over 4-20mA output, UL/CSA approved, 5 x 3/4"NPT entries, painted 316 stainless steel, with optional Foundation Fieldbus™ output and local HART interface port, configured for XNX toxic and Oxygen sensors. XNX-UTAE-NHNNN XNX transmitter, HART over 4-20mA output, UL/CSA approved, 5 x 3/4"NPT entries, painted LM25 aluminium, with optional local HART interface port, configured for XNX toxic and Oxygen sensors. XNX-UTAE-FHNNN XNX transmitter, HART over 4-20mA output, UL/CSA approved, 5 x 3/4"NPT entries, painted LM25 aluminium, with optional Foundation Fieldbus™ output and local HART interface port, configured for XNX toxic and Oxygen sensors. XNX-UTSI-FNNNN XNX transmitter, HART over 4-20mA output, UL/CSA approved, 5 x 3/4"NPT entries, painted 316 stainless steel, with optional Foundation Fieldbus™ output, configured for Searchpoint Optima Plus and Searchline Excel. XNX-UTSI-FHNNN XNX transmitter, HART over 4-20mA output, UL/CSA approved, 5 x 3/4"NPT entries, painted 316 stainless steel, with optional Foundation Fieldbus™ output and local HART interface port, configured for Searchpoint Optima Plus and Searchline Excel. XNX-UTAI-RNNNN XNX transmitter, HART over 4-20mA output, UL/CSA approved, 5 x 3/4"NPT entries, painted LM25 aluminium, with optional alarm and fault relay outputs, configured for Searchpoint Optima Plus and Searchline Excel. 02104-N-XMAA Medium range system 40m to 120m ATEX complete TXR and RXR system, fully wired with flexible conduit, SS316 mounting plates and brackets, Aluminium XNX and junction box. 02104-N-XMSA Medium range system 40m to 120m ATEX complete TXR and RXR system, fully wired with flexible conduit, SS316 mounting plates and brackets, Stainless Steel XNX and junction box. 02104-N-XMAU Medium range system 40m to 120m UL complete TXR and RXR system, fully wired with flexible conduit, SS316 mounting plates, brackets, Aluminium XNX and junction box. 02104-N-XLAA Long range system 120m to 200m ATEX complete TXR and RXR system, fully wired with flexible conduit, SS316 mounting plates and brackets, Aluminium XNX and junction box. 02104-N-XLSA Long range system 120m to 200m ATEX complete TXR and RXR system, fully wired with flexible conduit, SS316 mounting plates and brackets, Stainless Steel XNX and junction box. 02104-N-XLAU Long range system 120m to 200m UL complete TXR and RXR system, fully wired with flexible conduit, SS316 mounting plates, brackets, Aluminium XNX and junction box. 02104-N-XLSU Long range system 120m to 200m UL complete TXR and RXR system, fully wired with flexible conduit, SS316 mounting plates, brackets, Stainless Steel XNX and junction box. 02104-N-XLAC Long range system 120m to 200m CSA complete TXR and RXR system, fully wired with flexible conduit, SS316 mounting plates, brackets, Aluminium XNX and junction box. 02104-N-XLSC Long range system 120m to 200m CSA complete TXR and RXR system, fully wired with flexible conduit, SS316 mounting plates, brackets, Stainless Steel XNX and junction box.